Regal's brand new 35 Sport Coupe (SC) is the smallest of this Orlando, Florida manufacturer's line-up of four exciting Sport Coupe's – the other three being the 42, 46, and 52. 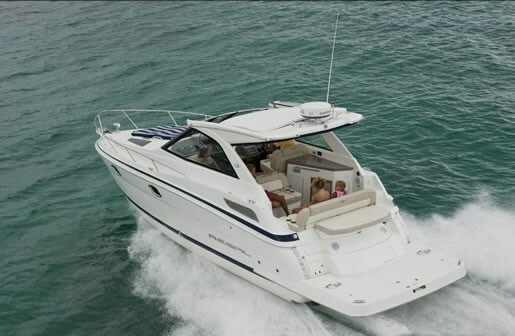 What distinguishes the Sport Coupe series from other express cruisers is the standard full-beam, electrically actuated retractable hardtops – the largest retractables in the industry, the emphasis on cockpit space and flexibility, and in the larger three Sport Coupe's, the availability of opening and sliding glass partitions enclosing a large portion of the cockpit. These four Sport Coupe's join the 35 and 38 Express models to comprise Regal's six models in its Sport Yacht series from 35 to 52 feet. 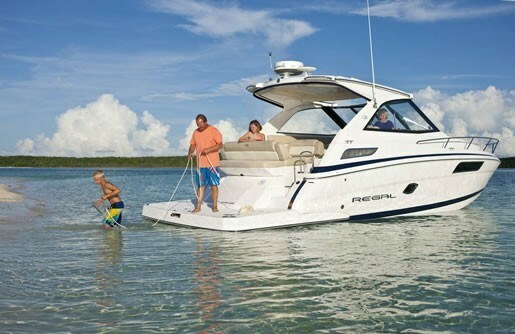 For 2012, Regal also offers fifteen models of Bowriders, Cuddies, FasDecks, and Express Cruisers from nineteen to thirty-five feet. Regal's Sport Coupe's cater to experienced boaters who recognize that most of their boating time is spent in the cockpit – whether cruising, at the dock, at anchor, entertaining, or just drifting and relaxing. In any cruiser, the cabin below deck is most often utilized only for sleeping, utilizing the head, and maybe eating, but often not. 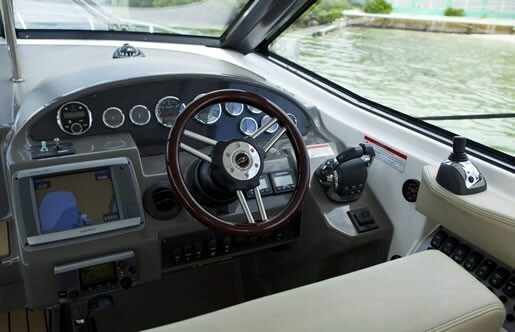 In other words, probably more than 90% of boating time awake is spent in the cockpit and the Sport Coupe series is designed to maximize this time. The new 35SC was designed with this in mind. The cockpit itself of the 35SC comprises over half the length of the boat. Add to that the huge extended swim platform and the ready access to the foredeck and its standard double-wide adjustable chaise lounge sunpad and virtually the entire above deck area is readily usable. It starts with a one-level cockpit sole allowing all guests on board to feel and be together for ease of conversation and entertaining. Seating accommodations are huge for a boat of this size with a four to six place L-shaped lounge opposite the double-wide helm seat. The aft portion of this lounge is convertible to become part of an aft cockpit dinette with standard removable table. 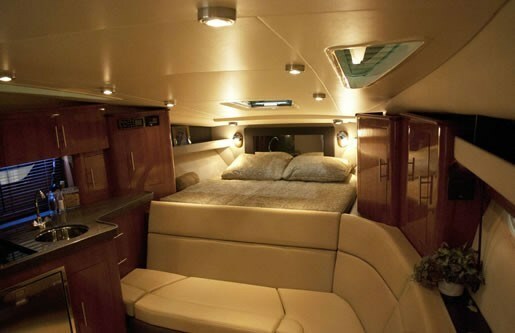 At the transom is another oversize 4-position convertible lounge or sunlounge. Other cockpit features include a starboard side refreshment center with Corian top, sink, faucet, trash receptacle, and storage locker. To this you may optionally add an icemaker, refrigerator, and gas grill. Six stereo speakers, amplifier, and subwoofer with remote control provide standard entertainment in the cockpit and this may be upgraded with a high performance package, a satellite tuner, and a flatscreen TV. Snap-in cockpit carpet, transom shower, 25-quart Igloo cooler, and walk-thru windshield to the foredeck is also standard. One unusual available option for a boat this size is what Regal calls its "Cool Cockpit" – reverse cycle air conditioning/heating in the cockpit to complement the standard cabin air/heat system. 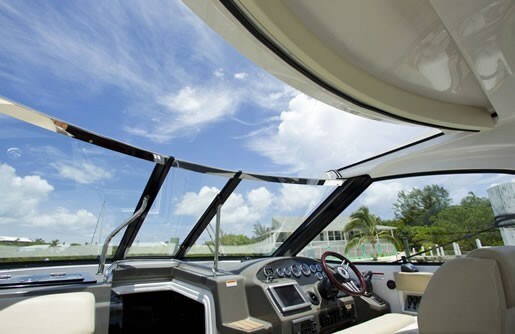 Down below, the cabin of the new 35SC is open, bright and spacious with two large overhead skylights plus the opening screened deck hatch plus another large starboard hullside window, plus three more opening portlites. The open concept offers a massive L-shaped lounge which starts across the foot of the forward berth and continues the entire length of the cabin along the starboard side and then drops down to continue along to become part of the mid-cabin seating/berth. Literally all of your passengers/guests can be comfortably seated here. The forward portion of this lounge electrically raises to add length to the forward centerline queen bed which offers an innersprung mattress, fitted sheets, pillows, and quilted comforter standard in your choice of four fabrics. A cedar lined hanging locker is found here along with two nightstands, a forward bulkhead mirror, privacy curtain, and storage. The side portion of this lounge converts to a sleeper and a portable dinette table with dedicated storage is standard. A 26" flatscreen television is standard in the salon as is the Fusion digital DVD/CD/AM/FM waterproof stereo with iPod dock. Opposite this lounge is the galley area with hardwood flooring, Corian countertop with sea rail, cherry laminate finish cabinetry, refrigerator, trash receptacle, sink, microwave, 2-burner electric stove, plus storage. 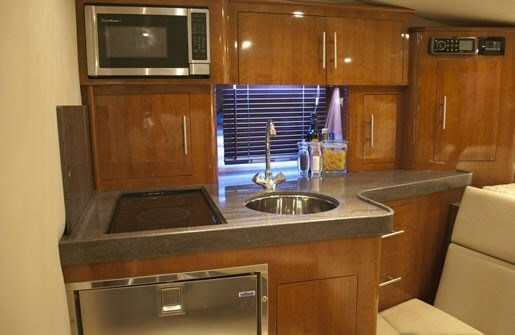 Aft of the galley is the head with standard amenities plus a full-length mirror on the door and a standard Techma Electric Silent Flush toilet. The mid-cabin features hardwood flooring and facing seating which converts to a conventional queen size bed. A privacy curtain is standard. An innersprung queen mattress is optionally available as is a privacy door. Twin gasoline or diesel sterndrives are offered for the 35SC from Volvo with the 5.7 Gi, 300 hp Duo-Prop or the D3 Diesel, both with or without joystick control, or MerCruiser's 300 hp 350 Magnum MPI gasoline power with Bravo III outdrives. Top speed with the gasoline engines is said to be well into the mid-forty mph range. If minimum canvas, a convertible hardtop, and flexibility in a fast, sleek-looking package are all part of your priorities, Regal's new 35 Sport Coupe is certainly one you should check out.